Espiritu SMR property. Photo by San Marco Resources. 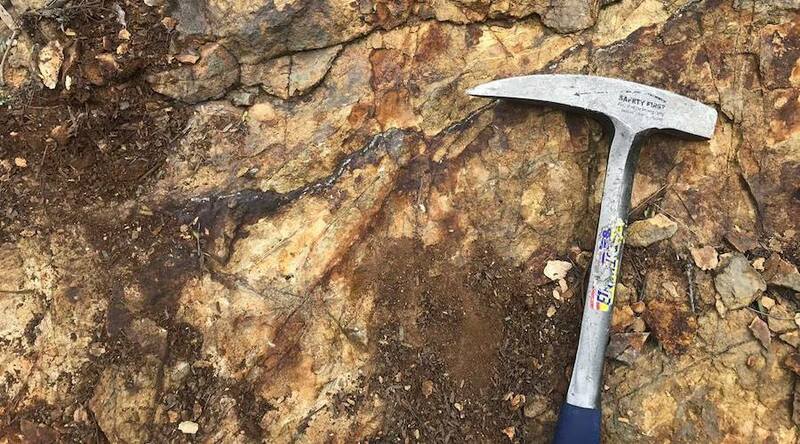 San Marco Resources (TSXV: SMN) today announced that, following the completion of a first-phase of exploration and evaluation, experts were able to confirm the existence of a porphyry copper-molybdenum-gold system at the Espíritu SMR property in northern Mexico's Sonora state. The 4697-hectare Espíritu SMR property is located approximately 15 kilometres east of the town of Sahuaripa and is 100% owned by San Marco. Historical drill hole assay data show indications of widespread gold and copper mineralization. According to the company, selected historical drilling information reveals that results for Drill Hole ESP-02-09 at 48.00 m are of 0.19 g/ton Au, 0.10% Cu, 2.0 g/ton Ag, including 1.50 m @ 1.80 g/ton Au, 0.07% Cu, 2.0 g/ton Ag. Meanwhile, Drill Hole ESP-06-10 yielded at 220.50 m 0.14 g/ton Au, 0.15% Cu, 1.1 g/ton Ag. According to the Mexican Geological Survey, Espiritu SMR covers portions of the San Felipe mineralized zone, a group of epithermal to mesothermal (gold, silver and lead) vein systems. In a press release, the Vancouver-based miner said that the recent exploration program, which was led by consulting geologist Luciano Bocanegra, confirmed that the multi-stage copper-moly-gold porphyry system has a minimum alteration footprint measuring 2.5 km x 1.2 km, open in multiple directions. The program also helped determine that copper mineralization may be preserved at depth within the shallower part of the porphyry system and that the best copper mineralization in surface and drill core samples is related to intense quartz-chalcopyrite-pyrite stockwork in potassic altered rocks. San Marco said the campaign also contributed to identifying previously unrecognized vectoring tools that can assist in targeting potential areas of best-grade mineralization to depth and buried targets under post mineral rocks. "We are pleased with the results and interpretations of this first phase of work at Espiritu SMR," said the firm's CEO Chris T. Grijalva in the media brief. "This extensive interpretive work and recent re-mapping of the project area has better determined the surface extent of the porphyry system(s) and evidenced several of these zones remain open for ongoing exploration."